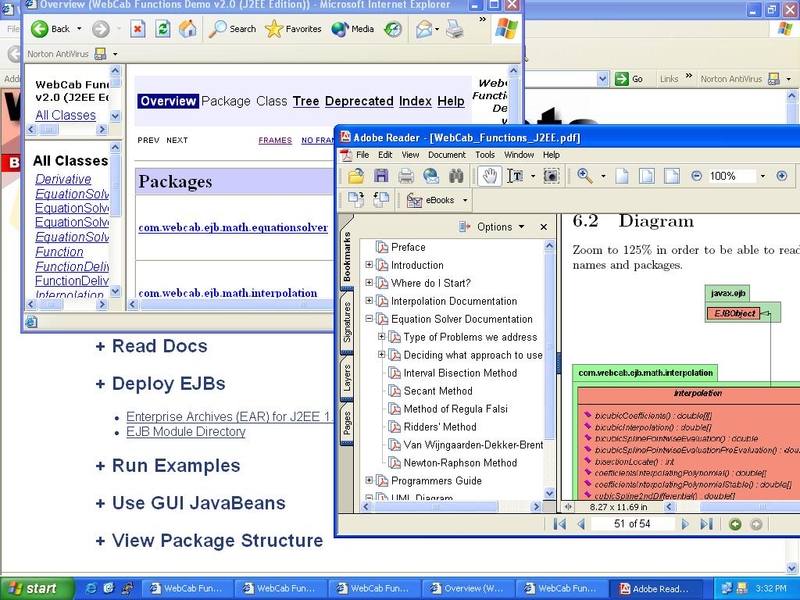 UDM Downloads > WebCab Functions (J2EE Edition)! EJB Component Suite offering refined numerical procedures to either construct a function of one or two variables from a set of points (i.e. interpolate), or solve an equation of one variable. The interpolation procedures provided include Newton polynomials, Lagrange's formula, Burlisch-Stoer algorithm, Cubic splines (natural and free), Bicubic interpolation and procedures for find the interpolation functions coefficients. In order to solve an equation we provide the Van Wijngaarden-Dekker-Brent algorithm, interval bisection method, secant and false position, Newton-Raphson method and Ridders' method. This suite includes the following features: 1) Interpolation Module: polynomial interpolation and extrapolation, coefficients of an interpolating polynomial, interpolation and extrapolation in two or more dimensions. 2) Equation Solver Module: Interval Method, Secant Method, Brent's Algorithm, Ridders' Method, Method of Regula Falsi, Method of Regula Falsi, Newton-Raphson Method, Fail-Safe Newton-Raphson Method.